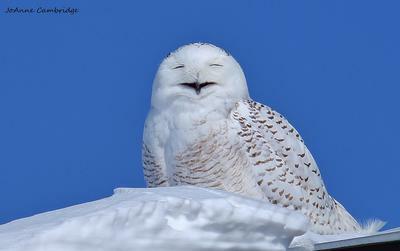 Have been seeing some Snowy Owls up in Simcoe County between Richmond Hill and Innisfil along the 400. So, I decided to take my camera go and see if I could find a few for some pictures. I was rewarded with this lovely Owl yesterday. I'm not sure, but I think it is a female. 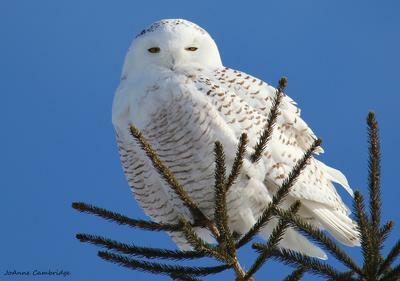 Thank you so much, Joanne, for sending us this report and photographs of this beautiful Snowy Owl - you certainly were in the right place at the right time! Thank you, I'm sure our readers will enjoy seeing these pictures as much as I have! Absolutely gorgeous! You are so lucky to see it and we are so grateful you shared this with us. Thank you.